Quality of life includes the benefits of good health, and the feeling of being safe. Gracie Jiu Jitsu means self defence via leverage where smaller, weaker people can defend themselves against bigger, and stronger opposition. So then why are the everyday people doing jiu jitsu predominantly men? The reason is because it's not your muscles that make jiu jitsu work. When you focus on your skeleton you can find all the leverage and strength you need to practice the techniques. You Got Bones? You Can Learn Self Defence. With jiu jitsu you no longer need to feel defenceless against anyone, fearful of your safety, or scared of being yourself in confrontation. When you do jiu jitsu, you learn self defence, which means you are more aware of your surroundings and have more ability to keep yourself safe in dangerous situations. It's how the women of our community can rise from feeling scared and overwhlemed to being empowered and free and ready to live to your fullest potential. Our Women's Only Jiu Jitsu Program starts July 2018. You won't need to share the mats with the fellas. 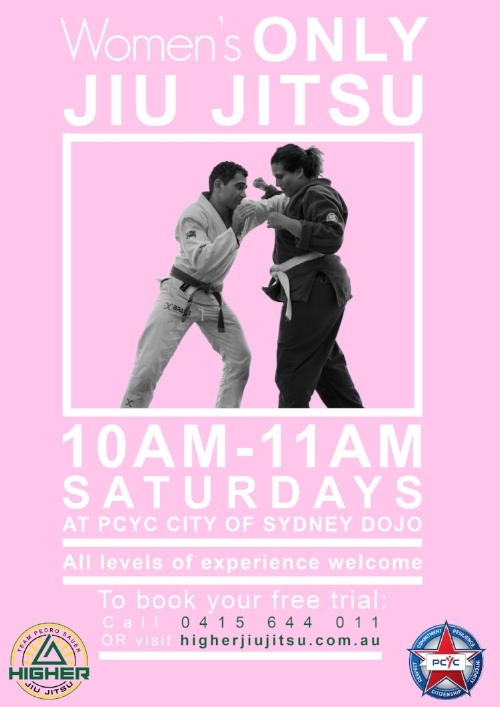 From 10am to 11am the dojo is all yours. And you'll get to learn the essentials of self defence in a safe, welcoming environment. Training won't always be easy, but it will be safe, and fun, and beneficial to every aspect of your life. You can learn how to stay safe, while you gain strength and mobility, lose weight, and hang out with your friends, all at the same time!